NEW YORK - Echoing the sentiments of other officials from Latin American and Caribbean at the UN General Assembly, Venezuela’s Minister for Foreign Affairs yesterday said countries in the region are suffering extreme weather and climate catastrophes due to rampant consumption and consumerism in which they played no part. 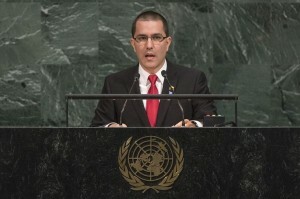 Calling for adherence to the principle of “shared and differentiated” responsibility when tackling climate change, Jorge Arreaza voiced solidarity with those affected by recent natural disasters, noting that such events had made millions of people victims of “a war they did not choose”. “This is the war of the developed countries and their capitalist system against Mother Nature,” he charged. “Let us not change the climate, let us change the system,” the Venezuelan minister said, adding that the responsibility must not fall on developing countries alone and that it was especially unfair for the United States – the world’s largest emitter of greenhouse gases – to withdraw from the Paris Agreement. He added that while the UN is a “noble instrument” intended to serve as a podium for discussion of pressing issues like the state of the planet, it nevertheless played host to “arrogant powers” such as the US, which “desecrated, disrespected and offended [this] house for peace”. Arreaza said Venezuela’s people had been directly threatened by US President Donald Trump, through military threats and the imposition of unilateral sanctions.